An actigraph is a small electrical device worn on the wrist like a watch. Equipped with specialized movement detectors, these instruments take measurements repeatedly over the course of the day to give an overall picture of your activity levels. In general, we tend to be much less active during periods of rest than in our waking hours. Based on this principle, data about our daily movements can be used to determine when and how we sleep. Actigraphs are usually worn for at least two weeks—sometimes longer, depending on the nature of the sleep problem being investigated. This allows a sleep specialist to obtain an accurate sketch of your general patterns of sleep and wake. Using this information, the physician can estimate how much time you usually spend awake, how long you typically sleep, and how regimented or changeable your sleep schedule tends to be. What can Actigraphy tell us about sleep? Actigraphy is recommended for the diagnosis of a number of different sleep issues, including circadian rhythm disorders, insomnia, and excessive daytime sleepiness. There are two major reasons why actigraphy may be preferable to other assessment tools when examining these sleep problems. First, these issues can be difficult to diagnose in a laboratory setting. 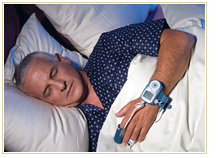 Sleep specialists often rely on polysomnography (PSG) when examining a sleep problem. But PSG involves sleeping at a clinic for, at most, two nights. Though they can still be informative, these two nights may not be enough to properly capture a sleep problem. For example, some people find that their circadian rhythms—daily cycles that control when we sleep and wake—can’t be synchronized with “normal” schedules. These individuals might fall asleep later and later each night and wake up later and later each morning (this is known as Delayed Sleep Phase Syndrome). This pattern would be difficult to detect with only one or two nights in the lab. PSG is like a snapshot, while actigraphy provides a long-term measure that can be used to identify trends in your sleep habits. Second, actigraphy allows the physician to see how you sleep in your regular environment. Someone who has frequent trouble falling asleep may be experiencing insomnia. However, even individuals who don’t have insomnia might have some difficulty trying to sleep in a new place. It can be difficult for a sleep specialist to distinguish between the effects of sleeping in a novel clinical environment and true insomnia. Similarly, a number of laboratory measures have been developed to evaluate daytime sleepiness—the Multiple Sleep Latency Test and the Maintenance of Wakefulness Test are two such tests. But these assessments, though revealing, are based on whether or not a patient falls asleep in a clinical setting. Some people who have trouble napping in the clinic may find it impossible to resist when in more familiar environments. With actigraphy, a clinician can monitor how you typically sleep at home outside the constraints of the lab. Though not as commonly used as other sleep assessment tools, actigraphy provides a useful mechanism for investigating your sleep and wake patterns. By wearing a small electronic device while going about your day-to-day activities, you can be helping a clinician to evaluate your sleep!